This is my great-great grandfather’s death certificate. 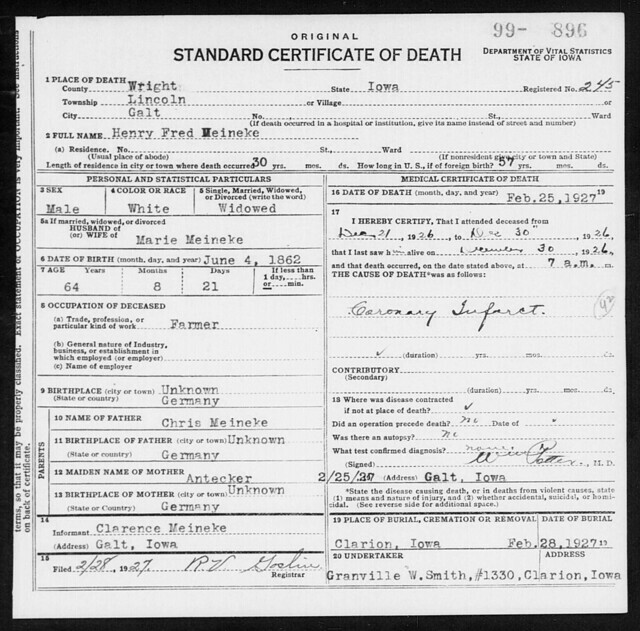 Family Search has added a bunch of new records, including death and delayed birth records for Iowa, so I thought I’d make a quick lunchtime trawl through them. My great-great grandmother’s death certificate is not in the collection. She died in 1905 and the dates of the death certificates span 1921-1940. Hers would have been helpful, because it may have included her mother’s maiden name. No complaints, though! They also added a bunch of burial records for the Archdiocese of Chicago, so I can do some Basquill hunting there this weekend.